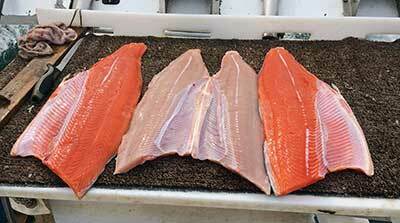 What Makes King Salmon Flesh Red or White? The line on your salmon fishing rod screams as it peels off the reel, causing your heart to race in anticipation of fighting, and hopefully landing, the iconic king or Chinook salmon that is doing its best to dive to the ocean depths. While catching these magnificent fish can be thrilling, it can be equally as exciting to anticipate the joys of sharing the bounty with friends and family around the dinner table. While king salmon are arguably one of the most sought after fish for sport anglers, they are also one of the finest delicacies to grace your table. But, did you know that kings can have differently colored flesh--red, white or even marbled? If you love to eat wild salmon, king salmon is a treasured treat. In my mind, each color has its own wonderful texture and flavor; yet my favorite at any moment is the one sitting on the plate in front of me. My perfect scenario would be to have a small fillet of all three at once, so I could continue my ongoing research into which tastes better. 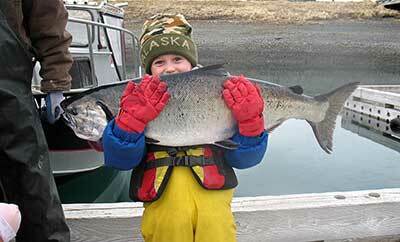 Most king salmon have a flesh color that ranges from reddish orange to pinkish-red. Not too long ago the white-fleshed king salmon was considered a less desirable fish by commercial fishers and restaurateurs. Today, the white or ivory king is highly sought after and brings a premium price at the market or restaurant. Catching a white king is entirely by chance, so their availability to both the sport angler and consumer is highly variable, depending on the luck of the day. So are these the same fish, or are they a different sub-species of Chinook salmon? And, what causes this difference in flesh color? No matter the color, they are exactly the same species of fish. Known by biologist as Onchorhynchus tshawytscha, or Chinook salmon, they are the largest of the Pacific salmon and have many different local names with the most common being “king.” The difference in flesh color comes from their genetically-determined ability to metabolize naturally occurring pigments from their food. These pigments, called carotenoids, are found in their diet of shrimp, krill, and crabs—crustaceans that are rich in astaxanthin, a carotenoid found in most marine life. Good analogies would be the orange beta-carotene found in carrots or the bright red carotene lycopene found in tomatoes. White-fleshed king salmon don’t have the genetic ability to break down their food and store the red-orange carotene in their muscle cells. The marbled flesh color sometimes found in king salmon comes from their limited ability to metabolize carotene, causing the flesh to take on a marbled look. Often, this marbled flesh is more reddish towards the spine and whiter near the belly. The trait that keeps these fish from taking on the red pigment is passed on or inherited from the adult spawners to their offspring. The ability to metabolize carotenoids is a dominate trait; therefore the majority of king salmon have red flesh. Essentially, all white kings come from the rivers and streams from the Fraser River in British Columbia, north to the Chilkat River in Southeast Alaska. Biologists with the Alaska Department of Fish and Game estimate that, overall, approximately 5 percent of the king population in this region carry the recessive trait that produces the white flesh. However, there are river systems where upwards of 30 percent of their fish have the white flesh trait. That said, there are some smaller river systems within the Fraser River watershed where nearly 100% of the population are white-fleshed kings! Casey Otis with a king. Anecdotally, there are some who feel they can predict if the king on the line is either a white or red king, depending on how it reacts when caught. But the only tried and true method to determine its flesh color is when cleaning your daily catch. A diet that includes wild salmon has been shown to yield health benefits. 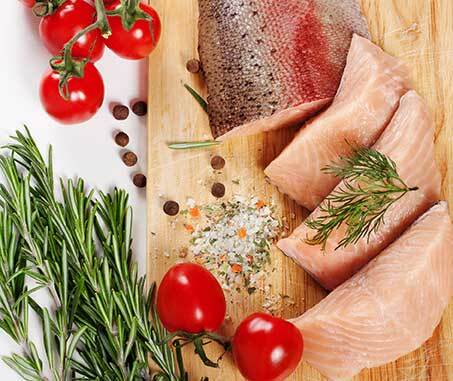 Some studies have shown that king salmon-- red or white-- are very similar in terms of their composition of heathy lipids, moisture, protein and omega-3 fatty acids, or the “good” fats. Seafood chefs rave about the melt-in-your-mouth flavor of the white king, but most don’t prepare them much differently than the red-fleshed fish. Each fillet brings a show-stopping delicacy to the dinner plate. When dining out you can expect to pay more for the white or marbled king since their supply is extremely limited and unpredictable. Bottom line, if you want to join with me in my taste testing research on king salmon, I would encourage you to buy your fishing license, and get out to enjoy your local sport fishing spots along the Pacific coast. Who knows…you might be that lucky angler bringing home a beautiful white king. But wherever your fishing trip takes you, enjoy the day and keep fishing for and eating sustainable wild Alaska salmon.